For 64 years, the local community has been coming together to invest in the youth of our region and specifically, cultivate a love of agriculture. As a worldwide leader in agriculture, Pennsylvania has so much to offer. It is in the Commonwealth’s best interest to make certain that agriculture remains a vibrant part of the state’s economy. We do that through events such as these where young people display their talents and passion for the state’s leading industry. I commend our youth and our community for its ongoing commitment to our agricultural heritage, especially at a time when many sectors of our farming economy are experiencing a crisis. In Harrisburg, we are taking action to help by working to attract a dairy processing facility to the state and by increasing the Department of Agriculture’s budget by more than $7 million this year. But it’s locally that the real work is being done by nurturing a love of agriculture in our young people and fostering an appreciation for farming in our communities. You have until Saturday to check out the Mifflin County Youth Fair. More information and the schedule is available online at http://www.mcyouthfair.com/. 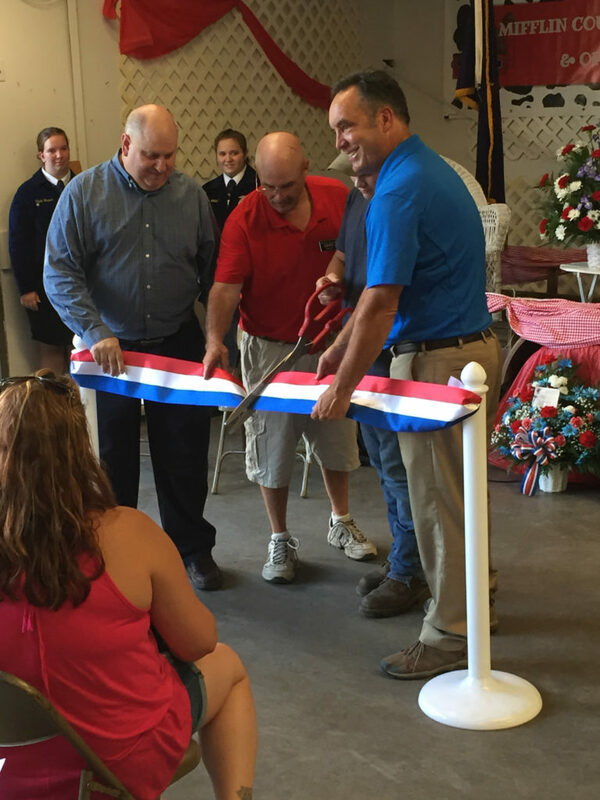 And we can’t forget another great local tradition – the Huntingdon County Fair, which also runs through Saturday. Lewistown Elementary School will receive $30,525 as part of a federal grant program to ensure students have fresh fruits and vegetables during the school day. A balanced, nutritious diet is one of the building blocks of learning. Fresh fruits and vegetables are an important – but expensive – part of that. This program offsets the costs to the school district and includes nutrition education so students can take what they have learned about eating healthy back home. The school is one of 200 elementary schools around the state to receive a grant. Pennsylvania was awarded a total of $5 million from the U.S. Department of Agriculture’s Fresh Fruit and Vegetable Program. Schools that qualify for the grant have more than 50 percent of the students that are eligible for free and reduced meals. Providing healthy food choices fosters a healthier school environment. Eating more fresh fruits and vegetables impacts the student’s health both now and in the future. Thank you to the Centre County HOPE Initiative and the Centre County District Attorney for hosting town hall meetings that further the discussion about addiction and the role we all play in fighting this epidemic in our communities. If you missed it, you can watch the most recent Opioid/Heroin Town Hall to learn more. In addition, thank you to my staff who volunteered their time at the event. The opioid crisis cannot be handled from Harrisburg alone. We must all continue to work together to stem the tide of deaths related to opioids. Action at the grassroots level has been extremely effective in raising awareness of the opiod crisis which is impacting communities across the Commonwealth and this nation. I commend the HOPE Initiative for their work in this effort. I am grateful to Penn State President Eric Barron and the Board of Trustees for their commitment to hold the line on tuition for Pennsylvania students enrolled in undergraduate programs. Working to keep the cost of higher education down is part of our $14.1 billion overall investment in education in the Commonwealth. This action is welcome news to Pennsylvania residents who are saving toward or paying for a Penn State education. By way of background, the 2018-19 state budget included a 3 percent increase for Penn State that was aimed at allowing the school to freeze in-state tuition for undergraduate students at all of its campuses. This is the second time in four years that the University’s in-state tuition for Pennsylvania students at all campuses has been frozen. I have been a long-time supporter of providing avenues for the Commonwealth’s four state-related universities to use the state funding they receive to directly offset costs to students from Pennsylvania. It’s an investment that is an important part of ensuring our students can stay local and receive a high-quality education after high school. The Legislature held the line on spending without asking for more money from taxpayers in this year’s budget. It’s gratifying to know the University is joining us in those efforts by not increasing tuition for Pennsylvania students. The Bridge Fencing Safety Act, which establishes requirements that PennDOT must install protective fencing along state-owned bridges, is now law. Act 65 of 2018 also requires fencing on bridges where instances of suicide or attempted suicide have occurred. The bill was introduced at the request of Randy Budd, husband of Sharon Budd of Uniontown, Ohio. In 2014, the Budd family was traveling on Interstate 80 in Union County when a rock was dropped from an overpass, seriously wounding Sharon. Due to incidents such as this, I co-sponsored this legislation to prevent harm from befalling anyone else. For more information on this act, please click here to visit the webpage. My Facebook page provides not only legislative updates but those all-important PennDOT construction updates for our district. I also enjoy posting pictures of local constituents that I meet and information on other local events happening in our neighborhoods and communities. You also can follow me on Twitter – my handle is @JakeCorman. On Twitter, I tend to provide more of a news update of everything going on legislatively in Harrisburg and the district. If you haven’t already, check out my social media pages.